We started last year with the front yard. In addition to being overgrown, the space served no function, and with such a small lot we were determined to make every square foot count. The areas in front of the fence went from weeds to an organized planting bed with a row of boxwoods for neatness and structure, and a row of Annabelle hydrangeas against the fence that will grow to offer an abundance of flowers mid-summer. 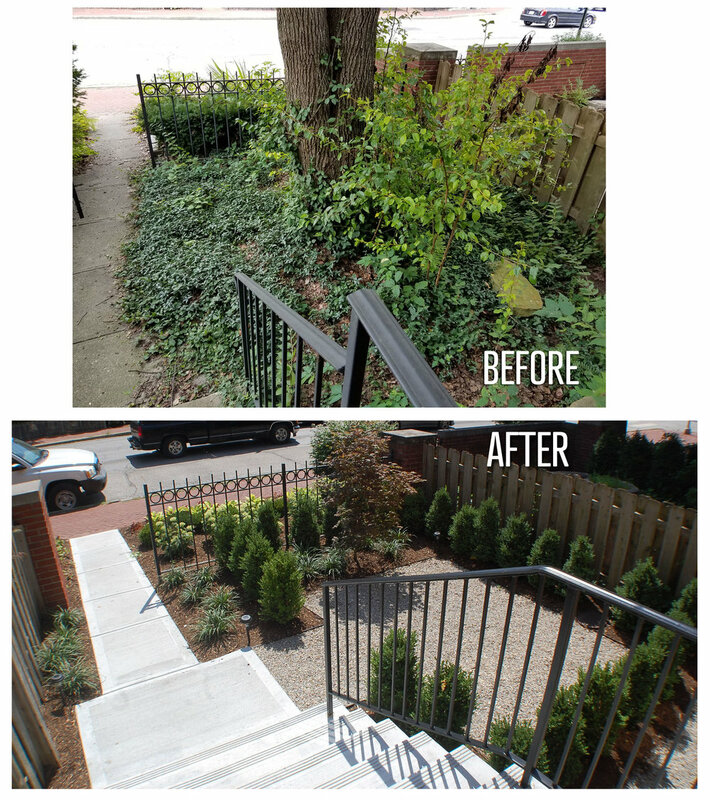 Inside the fence, we removed an invasive (and poorly placed) callery pear tree to make space for a small front yard seating space. The pyramidal boxwoods outlining the gravel pad provide a sense of enclosure to keep people from feeling totally exposed to cars and passers-by. We began work in the back yard in early summer of 2018. The back yard renovation features a new permeable paver patio, raised cedar garden beds with a ledge for sitting, and a small patch of synthetic turf for a play space. We’ve done our fair share of construction in urban neighborhoods and small spaces, and every site presents us with a new set of challenges during construction. As you can see from the photos, this home in downtown Indianapolis is short on room for parking and working. The garage closes the back yard off from the alley, so we were not able to use our usual machinery because everything had to fit through a 3 foot wide door. This crew got a good workout from all the hand-digging and wheel barrow hauling here, and we greatly appreciate all their hard work! On the back yard portion of this project we took care to document the entire process from site measurement to finished product, so we've put that together on the slideshow below. We love the before & after comparison on this project, and these clients were simply wonderful to work with. We are so pleased to leave them with a space to watch their young kids play and grow, a nice space to watch the 4th of July fireworks downtown, and some clean curb appeal up front. If you are interested in renovating or updating your outdoor spaces, visit our design services page for more information, fill out an online request form, or simply give us a call at 317-251-GROW. For ideas, check out our portfolio and our other project spotlights.